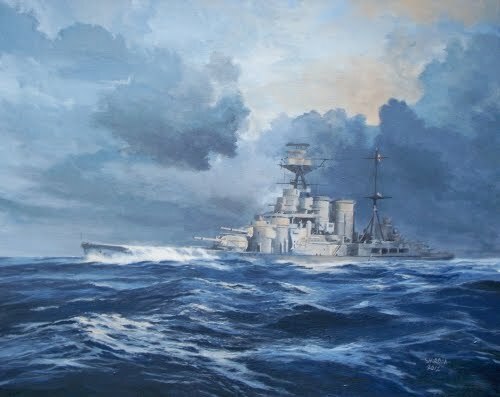 HMS Hood was launched in Scotland in 1918 and was regarded as the pride of the Royal Navy. She was a large ship, of the 'battlecruiser' class, and was famed for her speed and heavy armament. The basic design was flawed, however, with woefully inadequate armour across the decks which made her vulnerable to vertical or 'plunging' shellfire. In May 1941, in only her second ever combat, she was destroyed by exactly this kind of shellfire, launched from the German battleship Bismark. More than 1400 sailors were lost, only three survived. This is the second painting I have made of this fine ship, and quite possibly not the last. Looking at the reference documentation and then poring over the ship literally inch by inch left me in awe of the colossal size and complexity of this and the other capital ships of that "golden age" of the dreadnought, IE the first half of the 20th century.